Come join EPRD and the Evergreen Chamber of Commerce for music, nibbles, drinks and plenty of fun on a summer night! The 3rd annual Community Appreciation Party is our opportunity to thank our mountain community for shopping and playing LOCAL! This free community event will be held on the patio at Buchanan Park Recreation Center, overlooking Buchanan Ponds, on Thu., July 12, 2018, from 5-7:30 PM. Inside the adjacent Bergen Peak Room, learn more about EPRD. 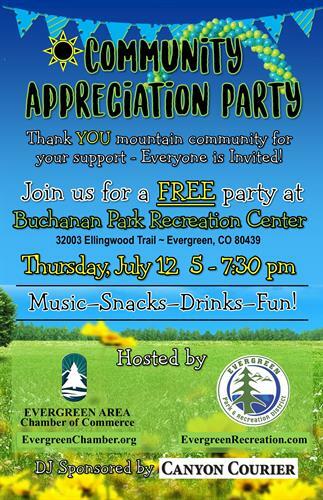 Buchanan Park Recreation Center is located at 32003 Ellingwood Trail, Evergreen, CO 80439. This event is free, though a donation is requested for alcoholic beverages.